Available in a variety of dazzling and stocked colors, add a pop of vibrance to your childs play room or bedroom. The Bastille Cafe Kid's Stacking Chair by Inmod is a reboot of Xavier Pauchard's classic design. Constructed of heavy duty galvanized steel and finished in a zinc powder-coat, they are built to last. Mix and match colors to match your d�cor and stack them away when it's time to clean up! Mix and match colors to create a whimsical seating environment, or play it safe with any one of the available color options. The Bastille Caf� Kid's Stacking Chair offers a fun mix of form and function. 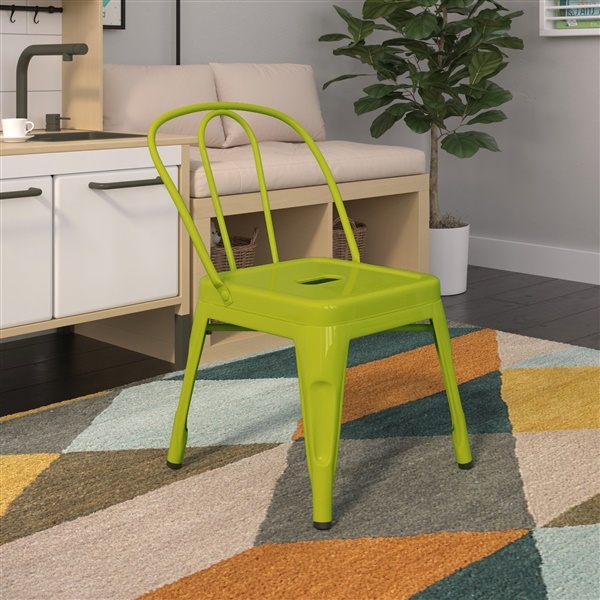 This all-purpose stacking chair is crafted from galvanized steel in an exciting array of colors to suit any nursery, kids' bedroom, playroom or family room. With it's powder & zinc-coated finish, the Bastille is protected against rust and can be used outdoors, and is stackable for convenient storage when it's time to put the toys away! The Bastille Cafe Kid's Stacking Chair is a fun modern-day re-imagining of Xavier Pauchard's iconic Marais A / Tolix Chair design, and has been rescaled to accommodate children (perfect for kids aged 2-6). Ultra modern and stylish chair for the kids and their friends. Stacking ability is a great feature. We purchased in blue with the bastille kids dining table. Looking forward to showing the combo off the next holiday or event! Very chic and stylish for a kids chair, exactly what we want. I bought this along with the kids table and I could not be happier. My daughter loves to do all her crafts sitting at this set. The only problem now is she wants to eat there also!